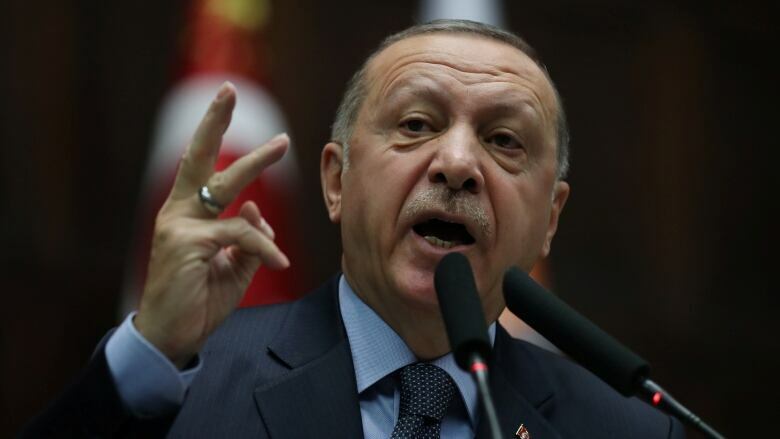 A senior U.S. official trying to negotiate the safety of Kurdish allies in northeastern Syria was apparently rebuffed by Turkey's president, who said Tuesday there would be "no concession" in Ankara's push against what he describes as terror groups in the war-torn country. White House national security adviser John Bolton met for roughly two hours with his Turkish counterpart, Ibrahim Kalin, and other senior officials at Ankara's presidency complex, but got no assurances on the safety of Syrian Kurdish allies — a condition for President Donald Trump's planned withdrawal of U.S. troops from northeastern Syria. 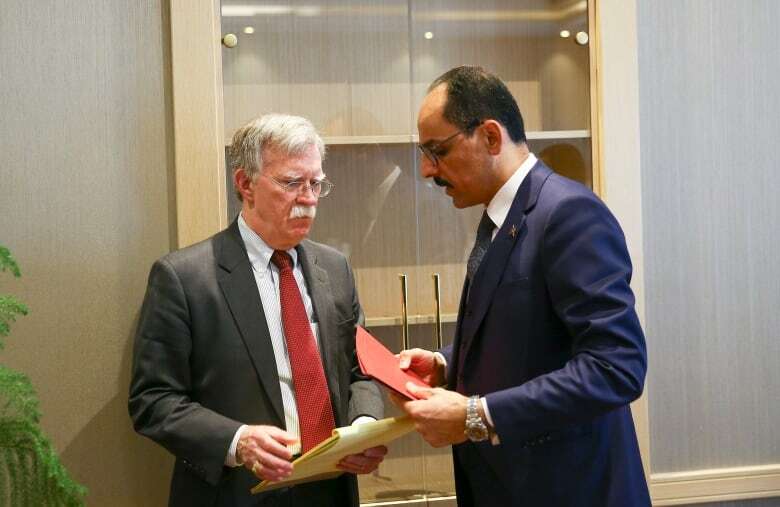 Bolton relayed Trump's insistence that Turkey refrain from attacking Kurdish forces that fought alongside U.S. troops against the Islamic State in Iraq and Syria (ISIS), a guarantee Turkey appeared unwilling to grant. "They had a productive discussion of the president's decision to withdraw at a proper pace from northeast Syria," spokesperson Garrett Marquis said in a statement. Marquis said direct military-to-military talks would continue Tuesday. Shahoz Hasan, co-chair of the largest Kurdish group in Syria, the Democratic Union Party (PYD), said it was clear from Ankara's latest statements that Turkey has a plan to go ahead with the offensive in Syria, but added "we will be ready." In farewell message, James Mattis urges Pentagon employees to 'hold fast' in defence of U.S.
After Bolton announced this week the U.S. pullout would not be as immediate as Trump had initially declared, U.S. allies were still seeking clarification from American diplomats. The Kurds, who have fought alongside U.S. forces against ISIS and fear an assault by Turkey if the U.S. withdraws, publicly said they were awaiting an explanation from Washington. Bolton said that before withdrawing, the U.S. would seek assurances from Turkey that it would not harm the Kurds — for the first time adding a "condition" to the withdrawal. Bolton had said the protection of U.S. allies in Syria, including the YPG, was among "the objectives that we want to accomplish" in order to begin the process of withdrawing U.S. forces. Kurdish officials have held conversations with Moscow and Syrian President Bashar al-Assad's government about protection, but Bolton called on them to "stand fast now." Bolton's pronouncements were the first public confirmation from the administration that the pace of the withdrawal had changed since Trump's announcement in mid-December that U.S. troops were "coming back now." Trump faced widespread criticism from allies about his decision, including that he was abandoning the Kurds in the face of Turkish threats. Officials said at the time that although many details of the withdrawal had not yet been finalized, they expected American forces to be out by mid-January. At the time, Trump had also said Turkey would step up the fight against the remnants of ISIS in Syria, but Bolton said Sunday that U.S. troops will eliminate what remains of IS as another "condition" to northeastern Syria. On Monday, Trump struck back at the perception that his intentions in Syria had changed. "No different from my original statements, we will be leaving at a proper pace while at the same time continuing to fight ISIS and doing all else that is prudent and necessary!....." he said in a tweet. While White House press secretary Sarah Huckabee Sanders said last month the administration had "started returning U.S. troops home," the Pentagon said Monday no troops had yet withdrawn from Syria, but there is an "approved framework" for withdrawal. In meetings with Turkish officials Tuesday, Bolton was joined by the chairman of the U.S. Joint Chiefs of Staff, Gen. Joseph Dunford, who will remain in Turkey for additional meetings with Turkish military officials, as well as Jim Jeffrey, special representative for Syrian engagement and newly named American special envoy for the anti-ISIS coalition. Jeffrey will travel from Turkey into Syria to reassure the Kurdish fighters they are not being abandoned, Bolton said. Also Tuesday, on the ground in eastern Syria, deadly fighting for the last area under ISIS control continued as the militants took advantage of bad weather to launch counterattacks. U.S.-led coalition warplanes and artillery pounded the Shaafa village in Deir el-Zour province near the Iraqi border, activists and a war monitor said as U.S.-allied Kurdish-led forces tried to advance.